24/2/07 - Leigh-on-Sea to London Fenchurch Street and return, London St Pancras to Sheffield, Sheffield to Doncaster. Doncaster to London Kings Cross. An away day to see Southend United play at Sheffield Wednesday. Only £7 from London to Sheffield on Midland Mainline, which was why there were about 40 southend fans on the train. Although Southend lost, I found the people of sheffield very friendly, talking to you on the tram, on the station and on the train. A very enjoyable day out. 28/2/07 - Wickford to Southminster and return. The start of this website! I did the journey merely out of curiosity and look what happened - a whole website!!! 3/3/07 - Huntingdon to Lincoln, Grimsby, Immingham, Gainsborough, Doncaster and return. ("The Great Central" rail tour organised by the Railway Touring Company). Although is was nice to travel behind steam for the first time in ages, it was a bit of a disaster with the train stuck in Grimsby docks for two hours because someone somewhere hadn't done their homework. This meant the final leg of the journey to Deepcar and back was cancelled, meaning I missed travelling along my beloved Woodhead route (or what remains of it). 13/3/07 - Witham to Braintree and return. Drove to Witham and did a quick journey on the Braintree branch - the start of many such journeys. 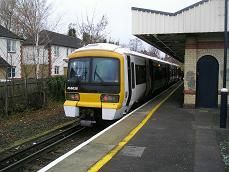 20/3/07 - Witham to Harwich Town and return. Drove to Witham precisely a week later and went on the Harwich branch. How Harwich Parkestone Quay has changed! 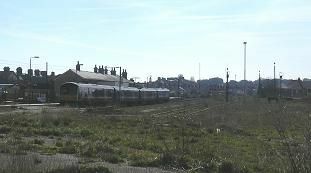 Hardly any freight traffic anymore and Harwich Town station looks really rundown. 24/3/07 - Leigh-on-Sea to London Fenchurch Street and return. London Farringdon to Brighton. Brighton to Preston Park. Preston Park to London Bridge. Went with my son to See Brighton play Huddersfield in aboring 0-0 draw - terrible standard of play. Also never been to Brighton before by train so a first for me. 28/3/07 - Witham to Walton-on-the-Naze / Clacton and return. Another drive to Witham and two more branches covered. Kept meeting the same guard, but involved hanging around Thorpe-le-Soken station wiating for a connection - pretty boring! 15/4/07 - Norwich to Great Yarmouth via Berney Arms Great Yarmouth to Norwich via Ackle. 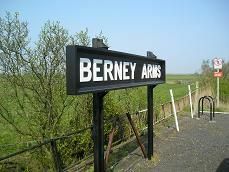 After taking my son back to university in Norwich by car, I some spare time, so decided to go on the Wherry Line to Great Yarmouth - mainly to see the famous Berney Arms station. I even got off there so I could say I had been on the platform! There were problems on the return journey because of Reedham Swing Bridge not working, so we came back via Ackle, meaning I didn't have to do another journey on this line. 26/4/07 - Witham to Felixstowe and return. Drove to Witham again and went on the Felxistowe branch today. Had a nice chat with a very friendly driver of my train who I told about the website. 2/5/07 - Mark's Tey to Sudbury and return. Been on this branch before, but decided to do it for the website. 15/5/07 - Leigh-on-Sea to Shoeburyness and return. Although I had lived in Southend for over twenty years I had never quite made it to the end of the line at Shoeburyness, so decided to do it today! 17/5/07 - Leigh-on-Sea to Upminster, Upminster to Romford and return, Upminster to Leigh-on-Sea via Ockenden and Grays. Another local journey to cover two nearby branches for the website. Though there were terrible delays on the way back leaving me stuck at Pitsea for nearly an hour. 1/6/07 - Witham to Ipswich, Ipswich to Lowestoft, Lowestoft to Norwich, Norwich to Cambridge, Cambridge to Ipswich, Ipswich to Witham. A nice day out all over East Anglia courtesy of a One Rover ticket. 23/6/07 - Potters Bar to Berwick-upon-Tweed and return (Lindisfarne /Alnwick Castle - Hertfordshire Rail Tours trip). An enjoyable day out courtesy of Hertfordshire Rail Tours and a very quick leg up to York. See my review here. 28/6/07 - Leigh-on-Sea to Barking, Barking to Gospel Oak, Gospel Oak to Richmond, Richmond to Stratford, Stratford - London Liverpool Street, London Fenchurch Street to Leigh-on-Sea. 7/7/07 - Rayleigh to Shenfield, Shenfield to Norwich, Norwich to Sherringham and return, Norwich to Shenfield, Shenfield to Rayleigh. 17/7/07 - Leigh-on-Sea to London Fenchurch Street and return, London Euston to Willesden Junction, Willesden Junction to Clapham Junction, Clapham Junction to London Waterloo. 4/8/07 - Leigh-on-Sea to London Fenchurch Street and return, London Bridge to Sittingbourne, Sittingbourne to Sheerness and return, Sittingbourne to Ramsgate, Ramsgate to Dover Priory, Dover Priory to Faversham, Faversham to London Victoria via Bromley South. 8/8/07 - Truro to Falmouth Docks and return. 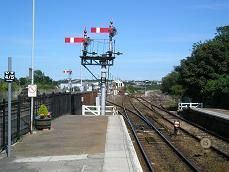 9/8/07 - St Erth to St Ives and return. 11/8/07 - Plymouth to Gunnislake and return, Plymouth to Liskeard, Liskeard to Looe and return, Liskeard to Newquay, Newquay to Plymouth. 12/8/07 - Exeter St Davids to Okehampton and return, Okehampton to Meldon Quarry and return (Dartmoor Railway). 13/8/07 - Paignton to Kingswear and return (Paignton & Dartmouth Steam Railway). 30/8/07 - Leigh-on-Sea to London Fenchurch Street and return, London Paddington to Princes Risborough, Princes Risborough to Aylesbury, Aylesbury to London Marylebone, West Hampstead to Sutton via Wimbledon, Sutton to Epsom Downs and return, Sutton to London Victoria via Mitcham Junction and Balham. 14/9/07 - Leigh-on-Sea to London Fenchurch Street, London Euston to Crewe. 15/9/07 - Crewe to Manchester Piccadilly, Manchester Piccadilly to Buxton, Buxton to Sheffield via Peak Forest, Sheffield to Leeds via Wakefield, Leeds to Preston via Bradford, Burnley and Blackburn, Preston to Morecambe and return, Preston to Manchester Piccadilly via Bolton, Manchester Piccadilly to Crewe (The Buxton Forrester). 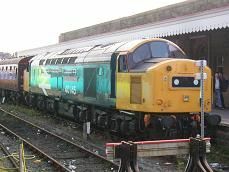 My favourite rail excursion of 2007, staying up in Crewe in a hotel right next to the station and a great journey all around the north of England behind an EE4 - class 40 to the rest of you! 16/9/07 - Crewe to Newport via Shrewsbury and Hereford, Newport to London Paddington, London Fenchurch Street to Basildon. Coming home avoiding the WCML and going the picturesque route via Shrewsbury and Hereford. Pity it was a bus for the last part of my journey. 16/10/07 - Leigh-on-Sea to London Fenchurch Street and return, London Bridge to Tattenham Corner, Tattenham Corner to Purley, Purley to Caterham, Caterham to Balham via Selhurst, Balham to London Bridge via Crystal Palace. 24/10/07 - Oxenholme to Windermere and return. 6/11/07 - Leigh-on-Sea to London Fenchurch Street and return, London Liverpool Street to Chingford, Chingford to Hackney Downs, Hackney Downs to Enfield Town, Enfield Town to Edmonton Green, Edmonton Green to Cheshunt, Cheshunt to Hertford East, Hertford East to Broxbourne, Broxbourne to Stratford via Tottenham Hale, Stratford to Lewisham (via DLR), Lewisham to Hayes, Hayes to London Bridge avoiding Lewisham. 13/11/07 - Leigh-on-Sea to London Fenchurch Street and return, London Paddington to Heathrow Airport Terminal 4, Heathrow Airport Terminal 4 to Heathrow Airport Terminal 1,2,3, Hayes & Harlington to Maidenhead, Maidenhead to Marlow, Marlow to Slough, Slough to Windsor & Eton Central, Windsor & Eton Riverside to Whitton, Whitton to Clapham Junction via Hounslow, Clapham Junction to London Victoria. 20/11/07 - Leigh-on-Sea to London Fenchurch Street and return, Bank to Waterloo (Waterloo & City Line) London Waterloo to Teddington via Twickenham, Teddington to Shepperton, Shepperton to New Malden, New Malden to Hampton Court, Hampton Court to Surbiton, Surbiton to Guildford via Effingham Junction, Guildford to Motspur Park via Epsom, Motspur Park to Chessington South, Chessington South to Clapham Junction, Clapham Junction to London Victoria, London Victoria to Lewisham via Denmark Hill, Lewisham to London Cannon Street. 24/11/07 - Leigh-on-Sea to London Fenchurch Street, London Euston to Watford Junction, Watford Junction to St Albans Abbey and return, Watford Junction to Bletchley, Bletchley to Bedford, Bedford to Luton. 4/12/07 - Leigh-on-Sea to London Fenchurch Street and return, London Cannon Street to Woolwich Arsenal via Blackheath, Woolwich Arsenal to Greenwich, Greenwich to Lewisham (via DLR), Lewisham to Dartford via Eltham, Dartford to Hither Green, Hither Greem to Grove Park. Grove Park to Bromley North. Bromley South to Blackfriars via Catford. 8/12/07 - Southend-on-Sea to Lincoln Central via Barking, Stratford, Finsbury Park and Grantham. Lincoln Central to Metheringham. Lincoln Central to Basildon via Sleaford, Peterborough, Finsbury Park, Stratford and Barking. Basildon to Leigh-on-Sea. (Lincoln Christmas Market trip organised by Hertfordshire Railtours). 22/12/07 - Leigh-on-Sea to London Fenchurch Street and return, London Paddington to Twyford. Twyford to Henley-on-Thames and return. Twyford to Reading. Reading to Oxford. Oxford to Bicester Town and return. Oxford to Banbury. Banbury to London Marylebone. 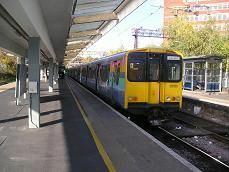 29/12/07 - Meadowhall to Doncaster via Rotherham and return. My final outing of the year, staying up in Sheffield to attend the Southend United v Doncaster Rovers match, whilst my wife went shopping.